Does this mean we can make Iron Fist less crappy? When I was younger, I remember reading Space Hawks, a series of Choose Your Own Adventure books. I read that book over and over again to see what would happen if I changed my mind on a certain plot point. One of my favorite video game series of all time is Mass Effect and again, I played at least two times to see how playing as Renegade was different than Paragon. Netflix is hoping to bring that same experience to video with its unveiling of interactive videos. 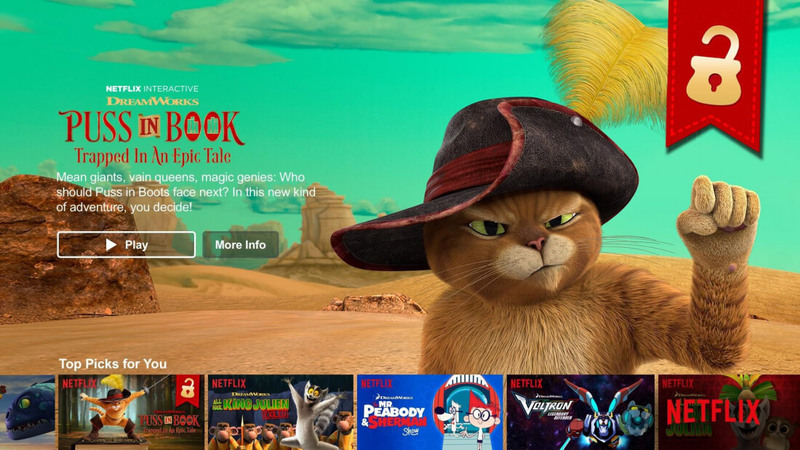 Netflix has released the first interactive movie, Puss In Book: Trapped In An Epic Tale today in a partnership with DreamWorks which stars Puss In Boots, the star of his own 2011 movie and Shrek franchise. In this story, Puss In Boots must escape a magical storybook. Another interactive movie titled Buddy Thunderstruck, which details the story of a dog and his friend Darnell race trucks, will release on July 14th. Both interactive movies will feature certain points in the story that allow viewers to choose which path a character will take. According to Netflix, Puss in Books could be as short as 18 minutes or as long as 39 minutes while Buddy Thunderstruck can theoretically last forever depending on the choice. Netflix is describing this as an experiment in order to test the waters of its 99 million subscribers. For now this new interactive medium will only work on iOS, Roku, game consoles, and some smart TVs. Android devices, Apple TV, and even the web will be left out for now. Choices during the video can either be done either through the touchscreen or remote control. If a user takes too long to answer, Netflix will choose for them. With heavy competition from other streaming video services such as Amazon, Hulu, and HBO, this presents Netflix with a unique opportunity to try something that nobody else is doing. In fact, the success of interactive media may completely revolutionize how we watch movies and TV shows. Imagine being able to influence what actions Daredevil does. Maybe you choose to save Claire or maybe you choose to save Colleen. Part of what makes branching storytelling so compelling in video games such as Mass Effect is that we get to see the consequences of our actions (and yes I know that the original Mass Effect 3 ending kind of made your choices null and void but you get the point).